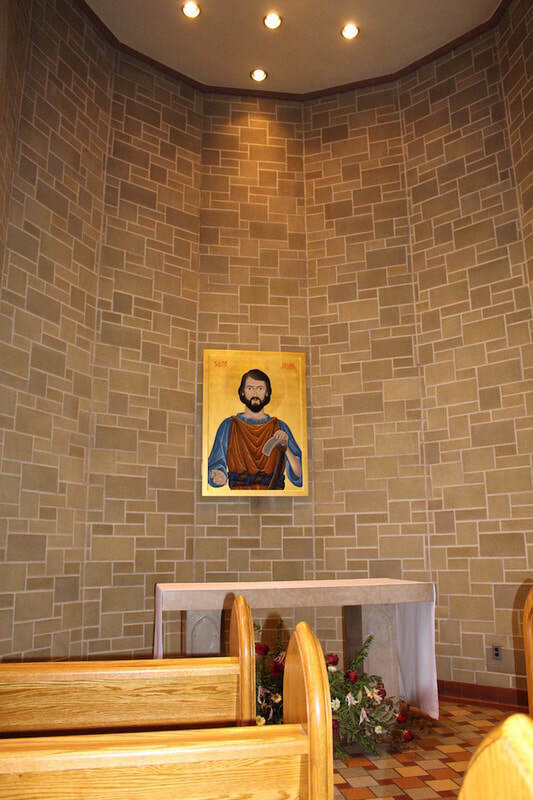 The masonry work has been completed and the icon of St. Joseph the Worker has taken its place in the side chapel of St. Joseph Basilica in Edmonton AB. 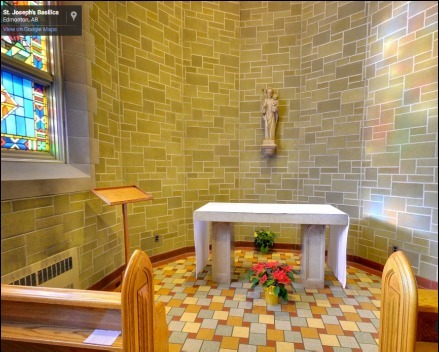 The picture shows the chapel as it was. The Archdiocese is bringing me to Edmonton for the blessing and unveiling of the plaque on July 25th. I'm hoping to have photographs to post once I get back. But I am a terrible photographer in times like this as I get involved in the ceremony and forget the camera. 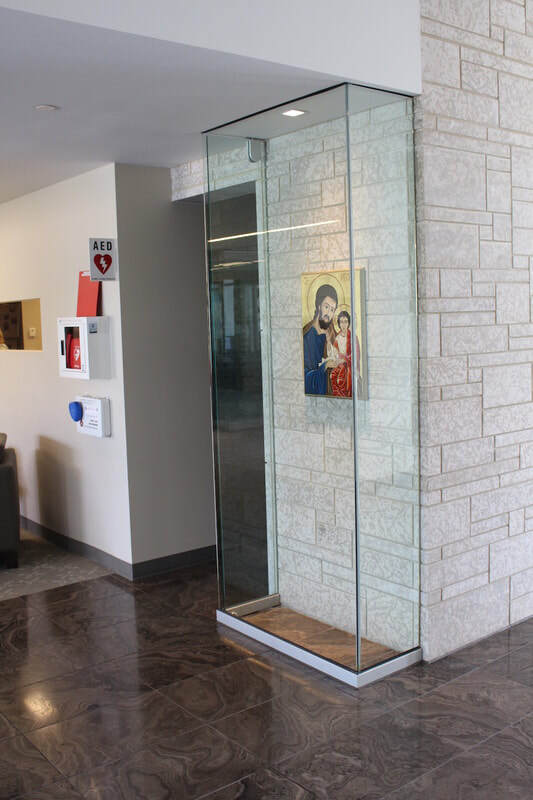 It was a great blessing to have the Archdiocese of Edmonton bring me there for the blessing of the chapel plaque now the installation of the St. Joseph icon had been completed. When I arrived in Edmonton I had a window of opportunity to see the Seminary's Main Chapel before it closed for the weekend. 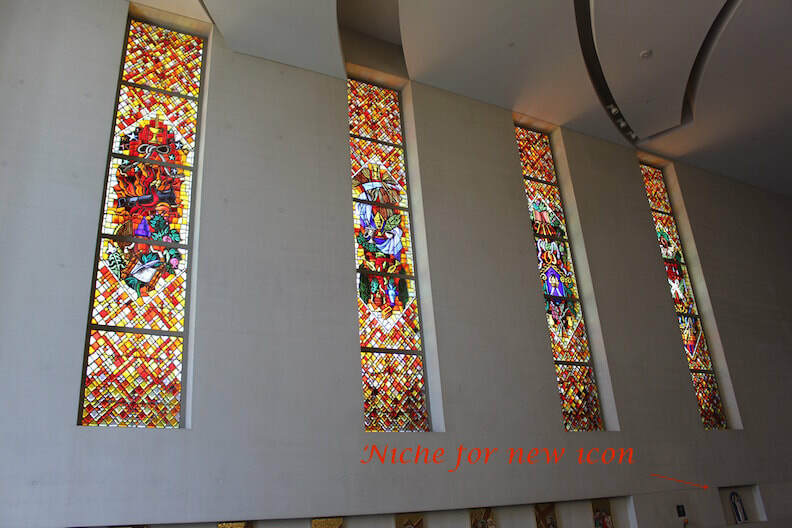 I had seen a number of pictures but as usual, I found that they didn't give a good sense of the actual space, and how the sanctuary was actually configured. It will be helpful as I continue with the Seminary's icon. 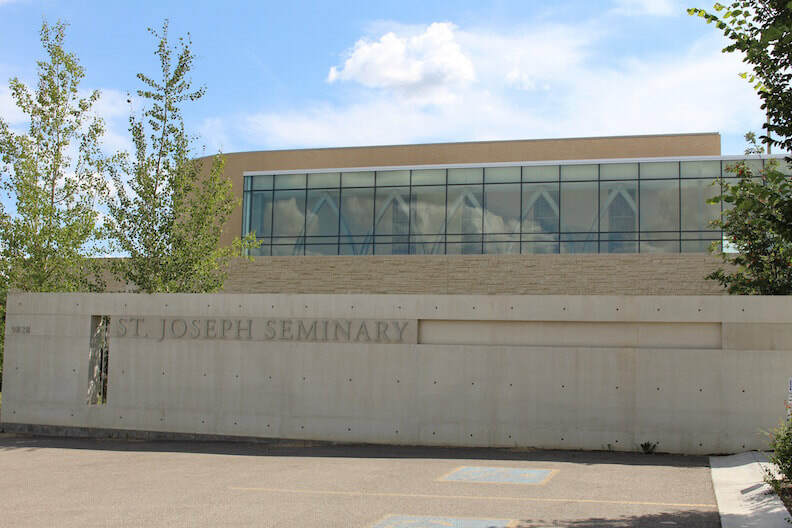 The Seminary is next the the Newman Theological College which use to be in St. Albert in my day, and my GPS served me well in finding it. 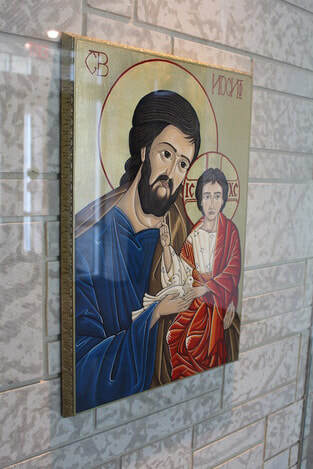 When entering the Seminary, I was pleasantly surprised to see my original icon of St. Joseph which I had written for them in the 90s (which was the starting point for discussions about the Centenary icon in St. Joseph Basilica). I was also surprised by the glass encasing it was in, a clear indication that it holds a special place. The arrow indicates where the icon will be installed once completed. It is scheduled to be in the Chapel for an event on September 2nd. The icon is incorporating some of the elements of the chapel. 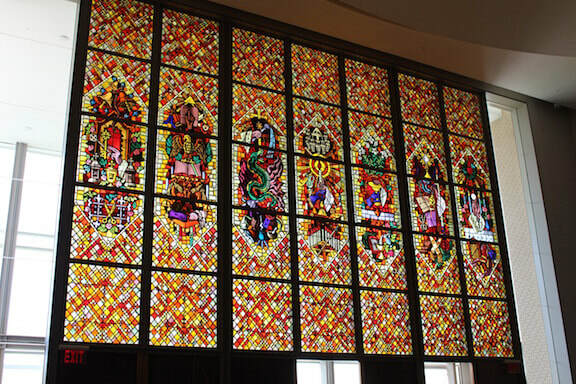 The stain glass windows in the Chapel are stunning; many of them from the original chapel at its first location. 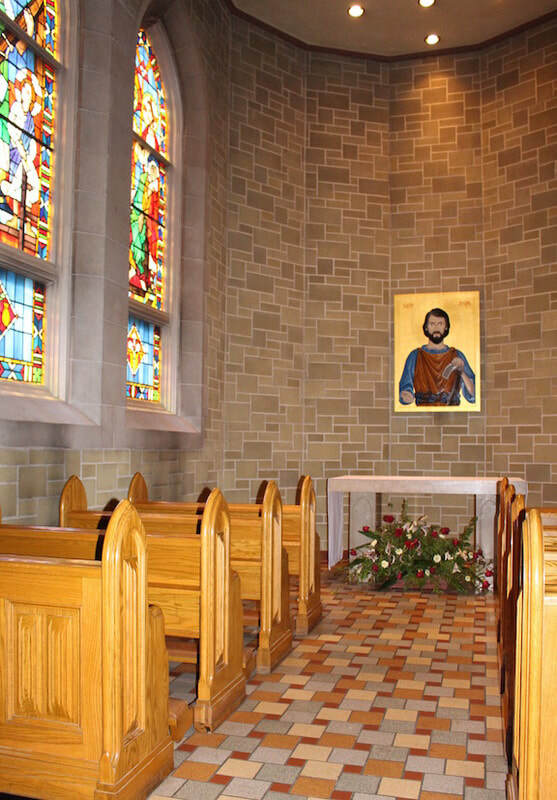 I then continued on to St. Joseph Basilica as arrangements had been made for me to stay at the Rectory, which was a wonderful opportunity for quiet and daily mass. Once settled in, I wanted to see the icon. It was wonderful to be with the icon once again and spend some quiet time with it over the weekend. 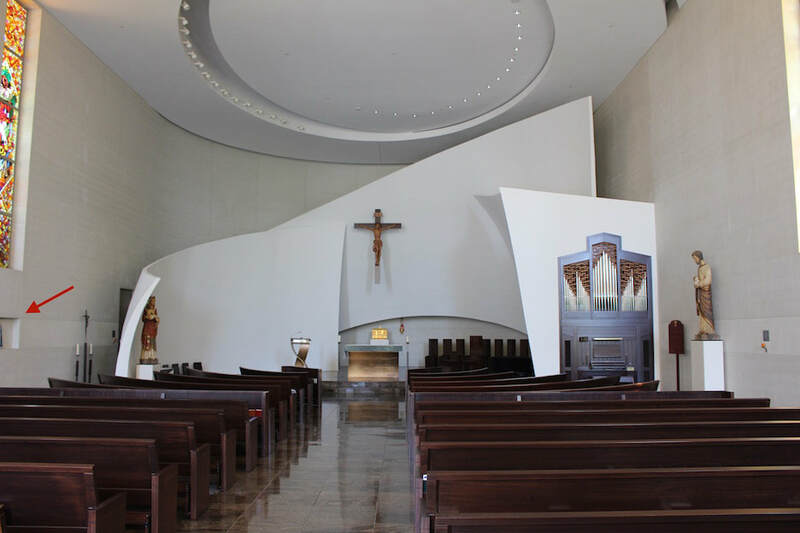 I was touched by the setting of its new home, and how parishioners enter it in prayer through the day. There had been a statue of St. Joseph in the chapel prior the centenary commission for a new icon of St. Joseph the Worker. Masonry work was required to first move the statue to its new location in the church just outside the chapel, and then restore the wall for the icon. The Icon was then placed in the chapel after completing its 13 month tour of the Archdiocese's Parishes. 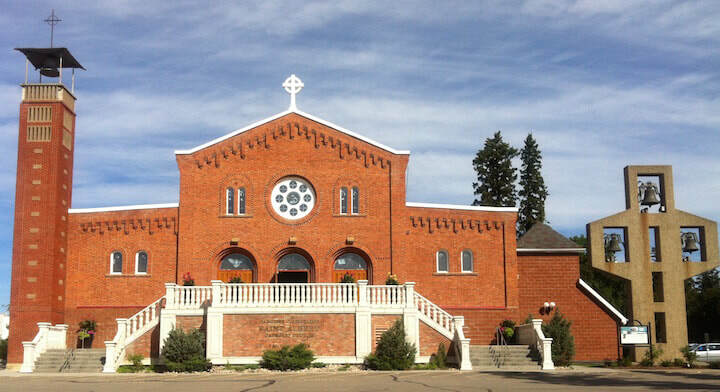 On Saturday, I took a drive to visit St. Albert, my home for 9 years in the 80s & 90s. I drove by the old house and was pleased to see that they've kept it pretty much as is. 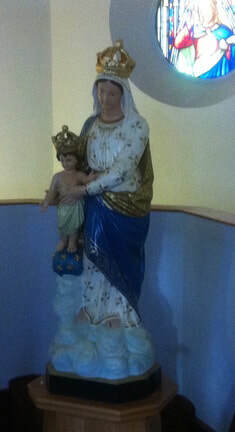 I then visited St. Albert Church and was pleased to see that the statue of Our Lady was also still as I had refurbished it back in 1993. Saturday evening was the World Youth Day Mass with Archbishop Smith at the Basilica (and packed), during which the plaque for the St. Joseph Chapel was blessed. Following the mass, I had a wonderful chat with the key people behind the Centenary Icon Project and Archbishop Smith joined us. All their planning and arranging for the extensive tour, while protecting the icon, etc. 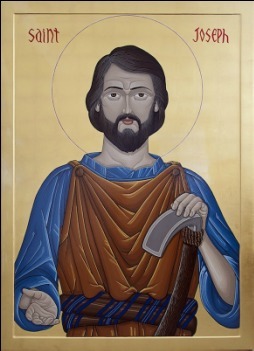 It was a wondering time of completion and great relief that all had gone well and I could easily see how the icon of St. Joseph the Worker was home and deeply received and now part of the fabric and spiritual life of the Archdiocese. It was decided that the plaque be mounted on the inside of the entry arch to the chapel. 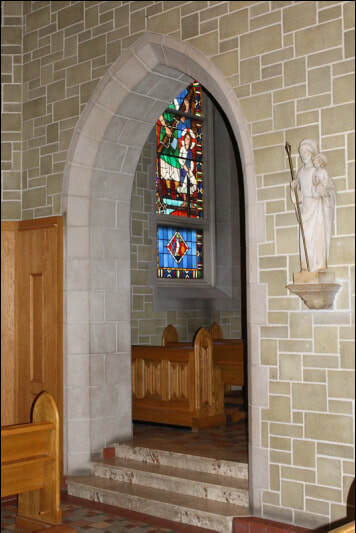 That way, it was visible upon entering, but once you've entered the chapel, it then wasn't about the plaque, but St. Joseph. I've indicated where it will be placed with a red box on the bottom picture. So today, Sunday, I took some quiet time again in the Basilica prior to the 10:30 mass, after which I packed up with my sincere thanks to Father Martin Carroll who was so welcoming, and began my journey to Airport. A full weekend of memories. 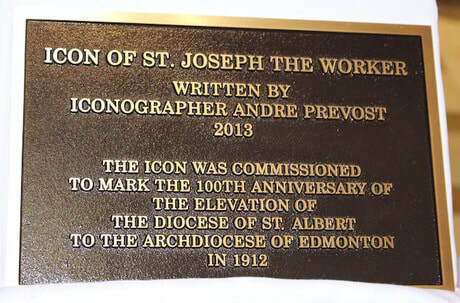 As we approach the feast of St. Joseph the Worker on May 1st, I received word that the masonry work is about to begin in preparation for the installation of the St. Joseph the Worker Centenary Icon in St. Joseph's Basilica, Edmonton. 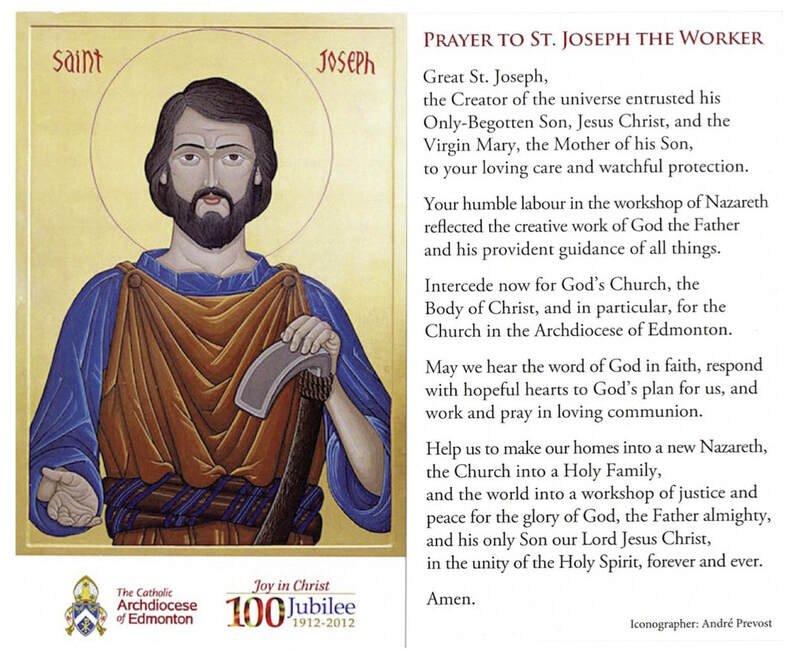 It was a wonderful surprise to receive word from Edmonton that preparations were underway for the installation of the centenary icon of St. Joseph the Worker in the Basilica, possibly around the May 1st Feastday. The architect, who is the design consultant for the Basilica will be in touch should he have any questions around the icon. It was also touching that the archdiocese will assist me in being present for the installation. It would be a great blessing.